Located on Park Ave between E 165th St and E 166th St, Extra Space Storage serves The Bronx residents near Morrisania, Claremont Village, Melrose, South Bronx, Foxhurst, and more. 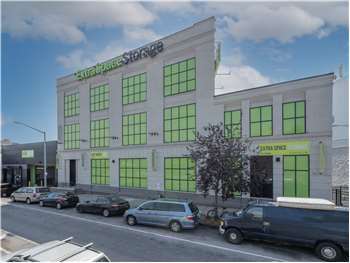 Locals will recognize our facility north of Days Inn Bronx Near Stadium across from the Extra Space Storage location on Webster Ave.
Are you a college student near Upper Manhattan or The Bronx who needs self storage over the summer or while studying abroad? Extra Space Storage is about 2.6 miles from The City College of New York, 3.5 miles from Fordham University, and 4.5 miles from Columbia University, so we're an accessible option! With a wide selection of storage units, climate-controlled storage, and exceptional security, Extra Space Storage on Park Ave can accommodate residential and commercial storage needs near The Bronx. No matter what you plan to store, our Bronx storage facility has the perfect space for you! We have sizes from 5x5 storage lockers to large 10x20 units with features like climate control and elevator access. To ensure the safety of our customers and their valuable belongings, we utilize security measures like 24-hour video surveillance, individually-alarmed units, security access to your floor only, and electronic gate access. It's the peace of mind you want in a self storage solution! Protect items from extreme cold and heat in The Bronx with a climate-controlled unit! This amenity ensures your storage unit stays comfortably between 55 and 80 degrees year-round. When you choose Extra Space Storage, you can expect the best. We provide reliable self storage in a clean, secure facility, and our friendly, professional staff goes the extra mile to ensure you have an excellent storage experience with us. Contact us today to reserve a storage unit in The Bronx! Is a good place if you are looking for a clean, secure and cheap storage to save your goods. Also have a good service. A great place to trust your belongings. It's hard having to put your life in a box but extra space storage makes it easy for you to know your property is safe. Extra space is the only place that I will put my belonging, they are clean and the staff is very patient and understanding. Drive south on Webster Ave. Turn left onto E 165th St. Turn left onto Park Ave. Our facility will be immediately on your right. Drive north on Melrose Ave. Keep right at E 165th St and continue straight onto Park Ave. Our facility will be immediately on your right. Drive west on E 163rd St. Turn right onto Brook Ave. Continue straight onto Park Ave. Our facility will be immediately on your right. Drive east on E 161st St. Turn left onto Melrose Ave. Keep right at E 165th St and continue straight onto Park Ave. Our facility will be immediately on your right.